From USS Boxer (LHD 4), a new ship on its first deployment, I went to USS Independence (CV 62), the oldest ship in the Navy. Too large to tie up at the pier the Boxer had used a week earlier, it anchored several miles off the coast of downtown Singapore. Upon returning from Thailand, I spent Saturday night partying with strike fighter pilots from the air wing. Sunday my host took me with him to the liberty boat pier for a ten-minute ride out to the Indy. Quite unlike the shabby little eight-passenger open boats in Thailand, these new enclosed ferryboats held perhaps a hundred people. We saw what a busy shipping point Singapore is, with other U.S. Navy ships and an Australian submarine among those anchored in the area. 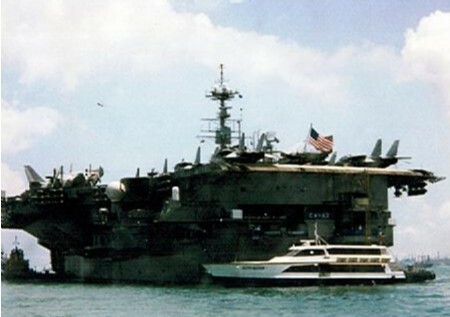 USS Independence is the only forward-deployed aircraft carrier in the U.S. Navy. Homeported in Yokosuka, Japan, its air wing is based at Atsugi. The ship and air wing are considered always deployed, even while at home, because of the short notice at which they must be prepared to move. One of my command's responsibilities is to look out for their best interests. While onboard, I visited the ship's maintenance spaces and all ten squadrons in the air wing. My host gave me a USS Independence ball cap with my name stenciled on the back. I was fortunate to get a stateroom in the center of the ship where the air was coolest. With an outside water temperature of 93 degrees, the ship's water-cooled air-conditioning system didn't do much cooling. The staterooms all used community heads (bathrooms) instead of two staterooms sharing one head as on most ships. Although the Indy has no women assigned, a head not too far from my stateroom was designated for females. I was given a blue bathrobe and flip-flops so I could walk down the main passageway to the shower. Credit card telephone calls can be made from "Sailor phones" at various locations throughout the ship--a system installed at AT&T expense. I know it works because I used my AT&T credit card to call my parents. With e-mail and telephone access, times have changed from the days Sailors could not communicate with the outside world. The commanding officer still has the option of shutting down outside communication to prevent information from going off the ship--such as news of a plane crash or a scheduled attack. Mail through the military postal system is free anywhere in the Western Pacific. People often shop in Korea or Hong Kong and send their purchases home to Atsugi free of charge. I was appalled to hear Sailors on the Indy mail dirty clothes home to their wives to wash and return. Then I learned only officers can send civilian clothes to the ship's laundry because of limited capacity. I wrapped up my Indy visit by watching flight operations from the tower where the air boss directed the show. One cycle consisted of launching a flight of approximately twenty aircraft and then recovering the previous flight returning from its mission. This process was repeated every hour or so throughout the day. As each jet took its turn on the catapult, flight deck crewmen attached the aircraft launch bar to the catapult shuttle. The steam catapult fired the shuttle down the deck and launched the jet off the bow--70,000 pounds of aircraft (fully-loaded F-14 Tomcat) from zero to 150 mph in two seconds. Two catapults operated almost simultaneously. As soon as a flight was airborne, the action moved to the rear of the flight deck. Each jet landed in a "controlled crash," jerked to a stop as its tailhook caught the arresting wire--54,000 pounds of aircraft (at full power in case it missed the wire) stopped in 200 feet. I left the ship in a C-2A passenger/cargo plane. We passengers pulled on life vests and helmets, then strapped ourselves into backward-facing seats. With no windows for a view, I could tell when my body slammed forward that we had been catapulted off the ship for the one-hour return flight to Singapore.